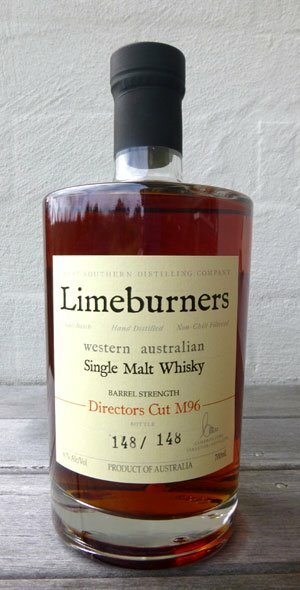 Limeburners is produced by the Great Southern Distilling Company which is located in Albany, Western Australia. This is significant, because it is about 2,600 kilometers north west of Tasmania, the heartland of Australian whisky. That is about the same distance as between London and Moscow. The reason this distance is significant is that Albany is described as having a Mediterranean climate whereas Tasmania is described as having a cool temperate climate. This means that the casks are likely to do different things in Albany, and this may include soaking up more of the flavour from the oak due to the different climate. 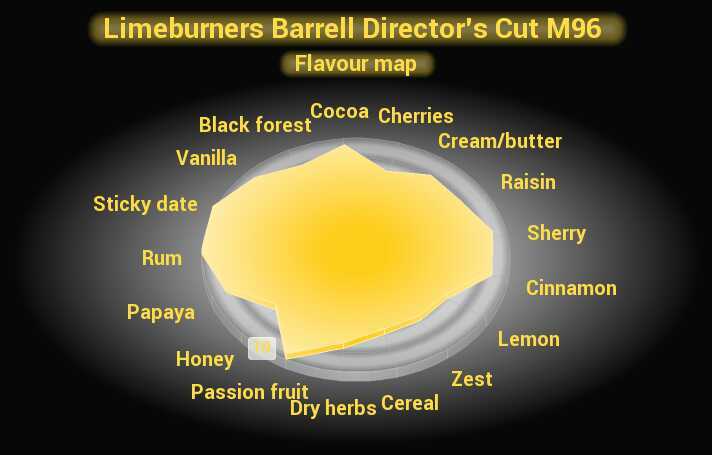 It is particularly clear that the Limeburners Director’s Cut M96 is a magnificently crafted whisky that stings the palate sharply with an incredibly diverse character and with lots of complexity. This lovely whisky is in my “top whisky” list. As you can see from the radar charts this whisky has, in my view, almost perfect balance. It strikes sharply like an angry cobra spitting its venom impatiently. Very much reminding me of a lovely cask strength rum, it exhibits some of the traits of a spirit that is matured in a warmer climate than Scotland for example. The nose on this whisky is sharp with gusts of sweet rum striking the nose, as raisin and sticky date develop with helpings of vanilla. With the addition of water out comes the lemon and zest, which cut through the dry wood. This whisky is very complex, and it is a beautiful texture (though it is slightly thinner than, say, the OveReem Sherry Cask 60%). One notable feature of this whisky is not only the diversity of flavours in this whisky, but the complexity of those flavours. The black forest coats the tongue with bitter dark chocolate, cocoa and luscious cream as the burst of dark cherries add a bitter-sweetness to the symphony of flavours dancing on the tongue. Then comes sticky date soaked with rum and tangy passion fruit, which adds a sour twist. The honey and papaya develop as well, bringing sparks of sharp and dull sweetness intermingled. All the while the herbaceous dry herbs tickle the tongue – parsley, basil and oregano. That passion fruit is fierce, bringing the sting of sour to excite the taste buds! The finish on this whisky is lovely and sharp, as the whisky vibrantly tap dances on the base of the tongue.